A little while ago I created wedding stationery for a couple who were getting married at Peppers Moonah Links in Fingal. 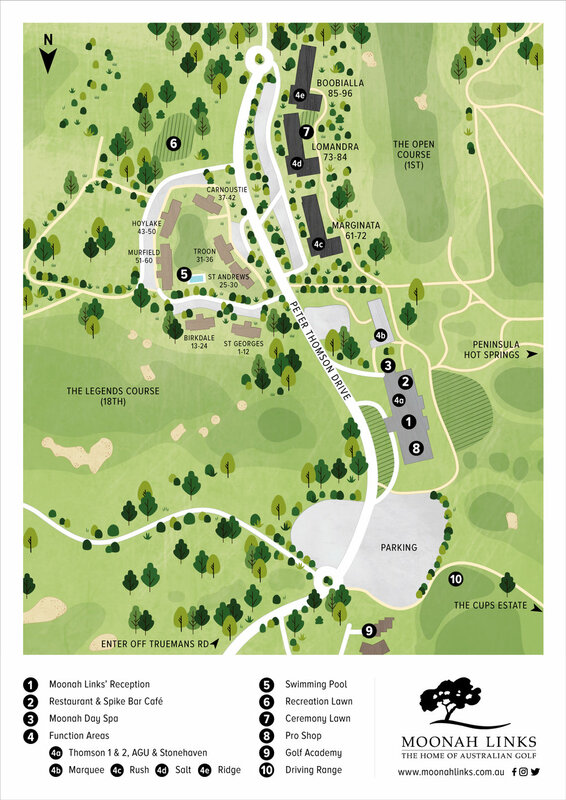 Their stationery featured an illustrated map of the venue so that their guests would know where to park and how to find their way around the large resort from the hotel’s reception to the ceremony site and the wedding reception building. Selina, the functions coordinator at Moonah Links saw the invitation and loved the map so much she got in touch with us to create a more detailed map of the resort that they could print and hand out to guests at reception. The map would be given to all different types of guests - wedding, corporate and leisure, so we needed to highlight all the appropriate buildings, accommodation, function and conference rooms, parking, golf facilities and resort amenities as well as the nearby attractions that can be privately accessed from Moonah Links. Above is the finished map, beautiful and green to showcase the lush, landscaped grounds of Moonah Links and the two 18-hole golf courses that surround the venue. Main roads are marked in white and golf cart or gravel tracks in beige. All the main buildings are included, with private residences deliberately eliminated and there is a simple key at the base that explains the numbers on the map. We also created a version that was translated into Mandarin as Moonah Links hosts a lot of international corporate clients. If you ever find yourself checking in or visiting Moonah Links be sure to pick up a map to make finding your way around fun!